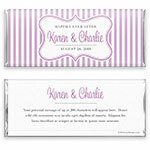 This charming and nostalgic candy wrapper is well-suited to a variety of occasions. Design: Vertical stripes with decorative frame. 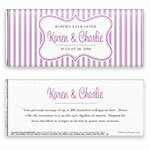 Personalization: Front message, names and date with back title and message.